Built by Westland Aircraft at Yeovil as there second a/c of a batch of 300 Spitfires of assorted marks I to V's against Contract No. 124305/40. AR213 was delivered to the aircraft storage depot of 12 MU, RAF Kirkbride on 240741. To 57 OTU at RAF Hawarden on 310741. Transferred to 53 OTU, RAF Llandow on 200243. Damaged on 190443 in Cat.Ac flying accident. Despatched for repairs to ... on 220443 and returned to 53 OTU, now stationed at RAF Kirton-in-Lindsay on 120543. Damaged in accident on 121143; despatched for repairs on 241143; returned to Kirton-in-Lindsay on 101243. ​To 8 MU, RAF Little Rissington on 170844; SOC on 301145. Sold to Allen H. Wheeler, Booker on 100347. Reg. G-AIST to G/C Allen Henry Wheeler on 251046; stored at Old Warden from 1946 until 1963. On loan to RAF Abingdon (1963-1969); stored at Abingdon; surveyed for use in Battle of Britain movie production (1967). Made Aw with mainspar from TB863 and flown in Battle of Britain movie production (summer 1968); based at Duxford (1968). As 'QG-A', 53 OTU. (1983); noted in this c/s at Eastleigh on 050386. To Victor Gauntlett and Peter Livanos, Booker/ Sheringham Aviation (0489-1995), Operated by PPS, Booker. ​Blue Max Museum of Film Flying, Booker (1996). As ‘K9853/QV-H’, 19 Sq in 0596. Under Raw with Personal Plane Services, Booker. Returned to factory condition. Repainted in her authentic c/s ‘JZ-E’, 57 OTU, RAF Hawarden. This was the c/s when F?L James Harry 'Ginger' Lacey was posted to 57 OTU for a rest. Lacey flew AR213 as his personal a/c. Ff on 111107 from Booker by Jonathon Whaley. Arrived at Duxford on 070809. To be based at Kemble. (...) Put up for sale in early 2011. 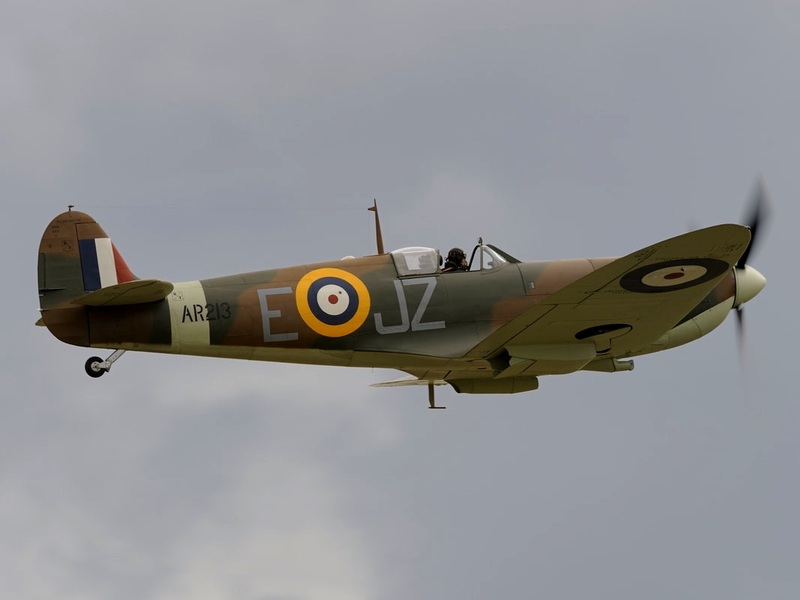 Flown to Biggin Hill on 090511. To Comanche Fighters LLC. As ‘P7308/XR-D’, 71 (Eagle) Sq. in 2013; P7308 was assigned to 71 (Eagle) Squadron at RAF North Weald in 1941 and flown by P/O William Dunn. AR213 (as 'P7308') based at Duxford. As 'R9632/LC' for filming of 'Dunkirk'-themed movie. Noted at Lelystad and Hoogeveen, The Netherlands for filming in summer of 2017. Reverted to previous c/s as 'P7308/XR-D, 71 Sq.